It has been about 3 months, but we seem to have 128KW of memory on the CDC 6500 now. From the picture you can see “CM = 303700”, which is just about 100KW free! 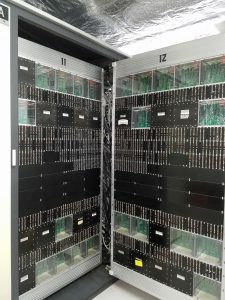 We have built 35 new Storage Modules, all of which work, and 32 of them are installed in the machine in place of Core Modules which were not happy. There are 10 more new Storage Modules in process, and the mostly assembled boards should be in next week. They will need their connector pins and pulse transformers installed. I will have to build more chassis sides and fronts for them, but that may take a while, as I still have 3 good modules, itching to go to work, sitting on my bench. Something I find interesting in this photo, is the memory access patterns. It is hard to see in the picture, but bank 30 is at the top of chassis 11, and bank 34 is at the top of chassis 12. The left two LEDs in the new storage modules are the Read and Write indicators. The ones on chassis 12 are bright, and the ones in chassis 11 are off. The top rows are separated by 4 locations! The machine isn’t real busy, it just has two instances of a prime number program running, but still… Can’t see that with Core Modules. 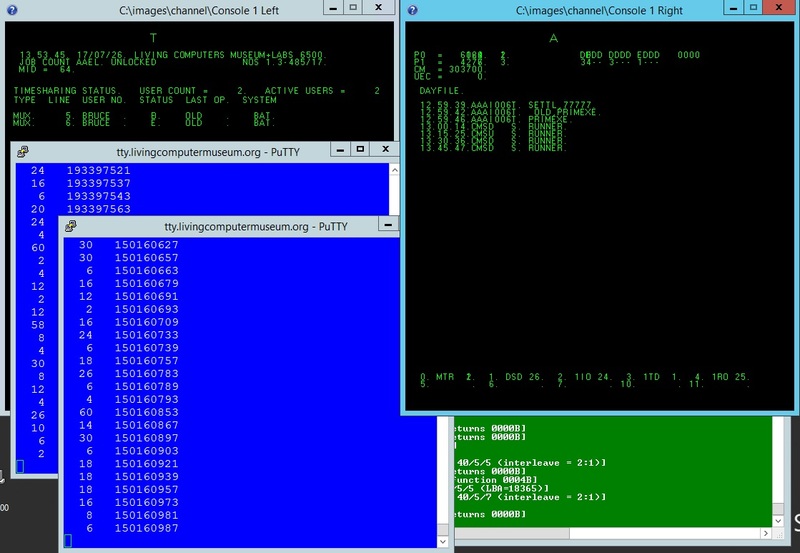 Anyway, let’s see, both CPUs working: check! All of memory working: check! Real card reader working: check! Real tape drives working: oops, not at the moment. I guess I’m not done yet. Next Next post: IBM 360/30 lost its memory?